Double Outlet Right Ventricle is a congenital heart defect in which both the aorta and the pulmonary artery exit from the right ventricle. In the normal heart, the aorta leaves the left ventricle and the pulmonary artery leaves the right ventricle. In addition, there is a large ventricular septal defect (VSD), or hole in the muscle wall (septum) that separates the right and left ventricles. 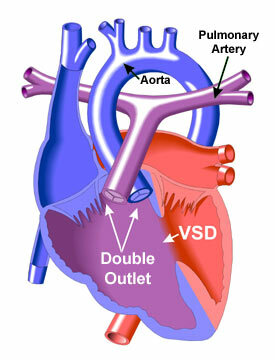 The aorta may be near the VSD or remote from it. Pulmonary valve stenosis may also be present.